Over my year of bookings I draw at many parties. Forces parties, private parties, birthday parties, garden parties and children’s parties. Everyone wants to have fun, really enjoy themselves and, hopefully, remember the day with some special memories. So what is it that can make it that bit more special? 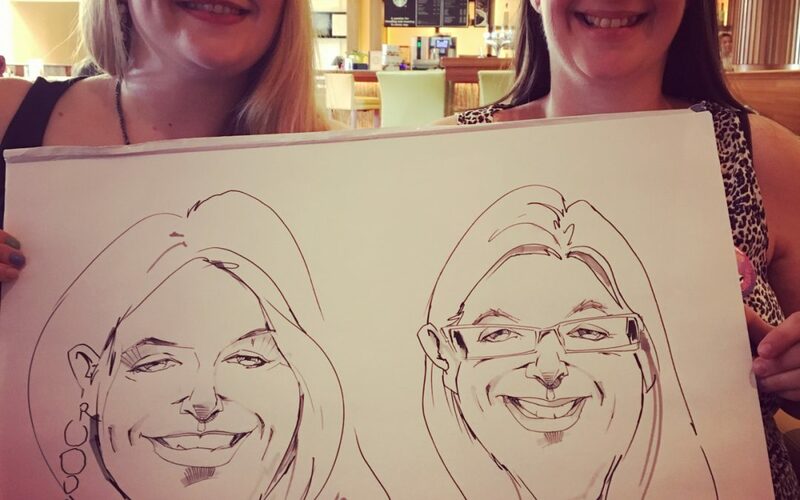 Well, a party caricaturist certainly helps to make any party one to remember. Generally everyone books a band or singer, and there are some really great acts and lots of choice too. But, are you looking for something else? You have some spare cash, and you are not sure what to do with it. Are you looking for the x factor? Or just a really great entertainment that everyone can enjoy! At many of the parties I draw at, lots and lots of people sit for me, and many of them say “What a great idea to have a party caricaturist, I have never seen that before”. Well yes, I admit it is! 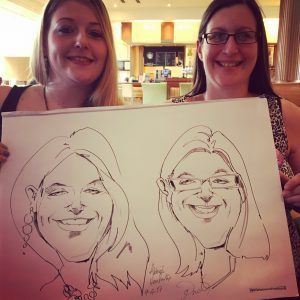 Not only do the sitters get a fun caricature portrait drawn by me but they can have their partner drawn on the same piece of paper too! Usually the host has paid the fee so the guests get them free too – a huge added bonus I might add! Beautifully drawn and quickly executed smiling, fun impressions for the lucky sitters to take home and frame. A fantastic memento, a superb reminder of fun times. The proof in black and white (with some tinting in grey for effect) of the payees incredible generosity too. And, don’t forget how thankful your friends will be, that you gave them the opportunity to fill the space on their walls with a quality work of art. For more information or to make a booking and check availability please call 07876 207100 or go to my contact page to make an enquiry!